Hello friendly Lurkers and welcome! My name is George and I asked my wife, Nina, to spank me! We have been married for 37 years and she has been spanking me off and on for about 26 of those years. I get spanked for stress relief and for fun, but unlike some, we do not do punishment spankings, nor are we a Domestic Discipline (DD) couple. I have no objections to either as long as it is consensual, it is just not for us. I, like most everyone, started out as a lurker and would comment as anonymous, then created a blog name and finally a blog of my own and have been blogging for about 6 months. What I have discovered is an amazing group of kind hearted and caring individuals and I am happy to say I have made some great new friends along the way. As a community we support each other and we compare adventures, but mostly we share. We share our ups and downs, our celebrations and our sorrows, and sometimes just random thoughts. Being a spanked husband, I am a minority blog, however, I have never felt anything other than welcome. If you have a question, I would be happy to try and answer. If you are inclined, just say hello, I would love to hear from you. I don't comment here often, but I do often read. Happy LOL day, George. Thanks for sharing your story. TL, I am guilty of doing the same on your blog, so I supposes that makes us even! Thanks for stopping by today. Roz, my friend, thank you. I too always enjoy seeing what is happening on your part of the globe! MrBBS, Thanks for stopping by. I wish you the very same. Hey GEOOOOOOOOOOOOOORGE! We don't care what you 'do' we are just so happy you delurked! Hi Willieeeeeeeeeeee! Discovering this community and then delurking (is that a real word?) was a nascent juncture into this neighborhood of blogland, and you were a special part of it all. 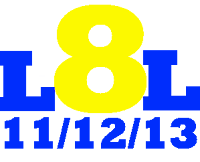 Happy LOL 8 day! I'm a regular visitor to your blog, and always enjoy your posts. Thanks Hermione, you're a peach! Thank you Sara, I appreciate your stopping by. Happy LOL 8 Day to you too. Cat, hello, and thanks for dropping by today. Since I do the same over at your place, we can just be semi-lurking friends! Happy LOL Day George! I don't think we've been here before, but it's great to meet you and thanks for sharing your story with everyone! Hello Clint and Chelsea, thanks so much for stopping by. I find it interesting how it seems we all have a story to tell, albeit a little different from anyone else, yet we all can identify with each other. Guess that is part of what makes this community so special. Zoe, great to hear from you! Thanks, and happy LOL8 to you too! Hi Katie, you are always so kind with your compliments! Thank you. I enjoy reading you posts as well. Happy LOL 8 back atcha! Happy LoL Day! I can never be a lurker here 'cuz I find it so easy to say something about what you share with us. You are so warm and welcoming and real - and I love your monthly photos! I hope you get that chance to meet some new friends today, but if not, I'm glad that I am one of your 'old' friends! Cali, my 'old' friend, LOL! You always have such kind things to say. When I grow up, I hope I am as nice as you. Only according to Nina, I will never grow up! Ha! Ha! Happy LOL8 to you too! What's your favourite spanking toy? Happy LOL Day. Spankedhortic II, thanks for the question. My favorite is a paddle I made with holes in it that is wide and thin. At first it causes more of a pleasant sting, but then becomes quite a pain after Nina gets going. I like the way it turns my backside bright red! Happy LOL8 Day to you and thanks again for the question. I'm very happy to see you in blogland, George! I ditto Cali -- you're warm, welcoming and real. Happy LOL Day! Rogue, thank you for your kind words. I do read your blog, but don't often comment so I guess I am what Cat described...a semi-lurker! Happy LOL8 day to you too! Hi Es May, thank you for the compliments. I am excited to have found a fantastic new world of special folks like you since I started my blog. ! Happy LOL8! Happy LOL Day George! I think you're a great addition to blogland. I hope you're around for many more LOL days! Hi Queenie, thanks. I appreciate your kind words and I too hope to be around for more LOL days. It was really fun! Hi George!!! Happy Lol day!! I found you through Cali and so glad I did! Hi Sarah, welcome and thanks. Cali is a new 'old' friend of mine as she likes to say. I hope we can get to know each other better as time goes by. Hi George! Happy belated LOL Day. I'm so glad you are here and willing to share with us. Susie, thanks so much. I don't think I have ever told you, but I love your pictorial moniker! It always makes me smile. You know, it is such a blessing to be able to share ourselves with kindred spirits!